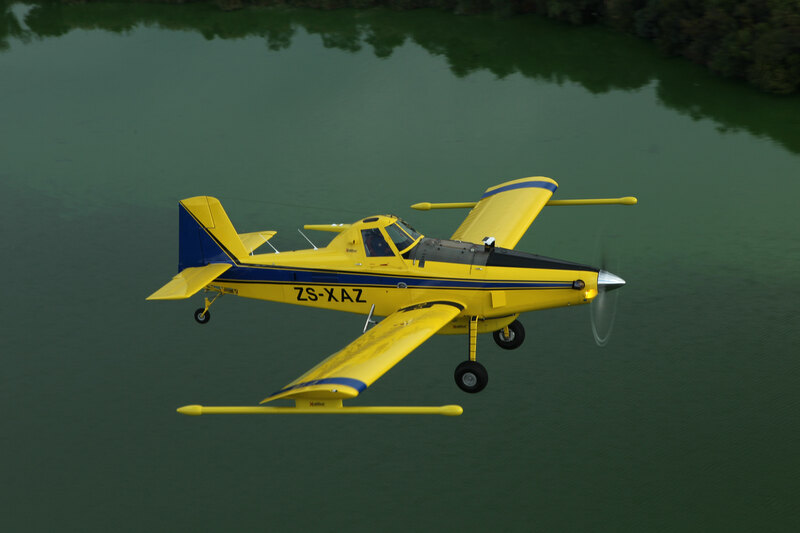 The Air Tractor has proved to be a very rugged and reliable performer on survey. 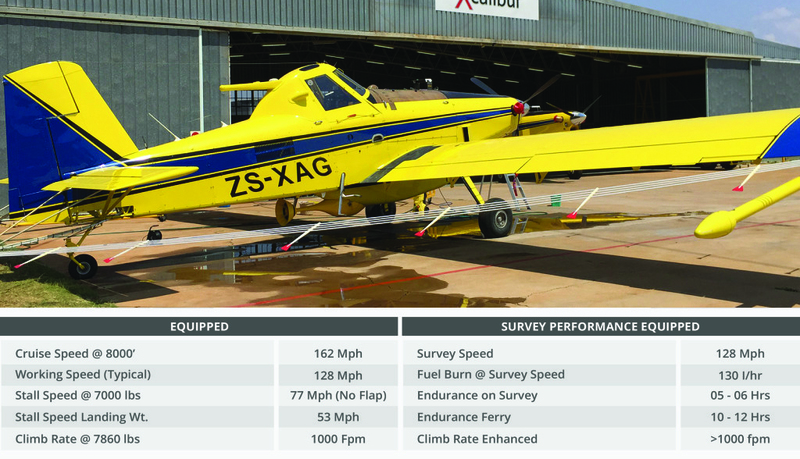 The ability to operate out of short poorly maintained airstrips, salt pans and farm roads make it a direct competitor to helicopters in the survey environment. Its truly remarkable crash survival capability places it in a safety category unmatched by conventional survey aircraft. The cockpit area is stressed to 40g while the rest of the airframe is constructed to conventional +3.8 and –2.33 g’s. The same approach is taken by the formula one racing fraternity in making the race cars as safe as possible for the drivers. This inherent safety was the driving factor in choosing the Air Tractor as an ultra low level (10m‐30m) survey platform. Certification basis for the Air Tractors is FAR 21.25 (a) (1). The aircraft meet the structural requirements of FAR 23 and the flight criteria, propulsion systems and equipment meet the requirements of Appendix B, CAM 8. The equipment installation has been certified by the South African Civil Aviation Authority in compliance with the requirements of FAR23 and CAM8. Appropriate STC’s have been issued. Take off and landing in less than 800 ft (244m), even when it is hot and high. Operate off semi-prepared airstrips in all types of terrain. Carry a load of more than 4,000 lb even in hot and high conditions. Rugged construction with a low 150-hour airframe/engine inspection interval and 39,000 hours before any scheduled airframe maintenance requirement. Proven, globally supported components from leading aerospace companies, including Pratt & Whitney, Hartzell, Garmin and Honeywell. Superior stability even at low-speed allows the aircraft to even undertake survey roles usually reserved for helicopters. Factory-approved modifications support easy installation of camera holes in the floor of the aircraft and side wall mounted track for the attachment of equipment. An electrically quiet aircraft with minimal electro-magnetic interference (EMI) and all major control systems mechanical rather than electric. The aircraft structure serves as an effective faraday cage blocking out external static electric fields. No requirement for control cable rerouting or other customisation of the aircraft systems.